Can you smooth things out? An important task 5/6J to see how you feel about Bullying. Can you smooth things out? What is the main feeling you get from this? What specific things give this feeling? What do you want to do with this feeling? ← Have some fun bloggers: Create a caption. I had sorrow flow through my vains and visions wiz through my head. Feeling the pain of what some kids feel in the endless sea off hell and pessimism, controlling there soul for melenoms. Never touching that out side trap in their own world of depression, looking at laughter, smiles and optermissom, wondering what it feels like having never felt it. I’d feel disscraceful if I did that to someone and it’s like the teacher said when they scrunched up the piece of paper no matter how hard you try the paper will still have scars forever. It makes me think of bullying someone would make you feel terrible inside and no matter how much you say sorry that person will have scars of no forgiveness. Well if I was the bully I’d feel so sorry for what I have done and I wouldn’t feel normal ever. When your sorry youhave to prove that your sorry not say a simple sorry. Really bad to bully people. But its smart not to and bullies think its cool but their stupid for bullying. (A1.its sad because people get hurt when blullyed. (A2. because its really mean to bully. (A3. stop bullying or you will get in trouble. The main feeling I have in this is envy, hateds and melancholy. The things that give me this is when they said they were sorry but the scars remain for every, and how it is saying that apologies mean nothing. I want people to feel what there victoms feel, the pain the tears and shadows for where the world revolves. I want to stop this and make the world safe, if 1 person can change the world so what can a town do? I had felt glum when I had read that when you say sorry theres still scars and that made me think saying sorry isn’t the only thing to do when you bullie someone. I remember that when I say sorry it does nothing I have to show I’m sorry to make them feel better. It made me think if bullies hurt people the person who was bullied will never get over it and be scared for the rest of their life. The main thing that impacted on me was when they said”scars will be there forever”. I would want convince people not to bullie because inside them they wil be scared for life. in my opin is bullying is just discrasefull and dont teachersng your prents fellings and god fellings i would rather staying home then go to school but i n dont like bullying thay cume to school to learn the teachers come to school to get paid and teacears dont like it. it makes me fell like why do we have to be in thisworld it just horble. with this felling i would pray to god plz stop it this it bad for the ploice. It makes me flee upset because of all the bullying that is going on. It makes me remember when I got bullyed and that was not a every good day for me and all I want to do is to forget about what hapen. I think of bullying as a disgrace to man kind, people only bully you if they have nothing better to say or they are just plain jealous of you. Just remember that you should always tell a teacher about it, fighting the bullys just makes it a worse situation and you will get even more bullied at school somtimes if you fight back the bullys will start to bully you OUTSIDE of school now that is a serious situation because if your alone and the bullies walk up to you they will start to tease you or even beat you up. This is a very serious matter because there is no one around to help you at all. I want to try and help the people that get bullied and somehow give justice to the people that bully others because if they dont get there justice they will keep on bullying others and that will make the situation much, much worse for the person getting bullied and worse for the teachers/parents that have to deal with it. I get this feeling because I have seen people get bullied and it is hard to fight for them because you will start to get bullied and if you fight there fights they will always need you around to fend the bullys off but the chances of you beating the bullies is not very big because people usually bully in groups so if its you trying to fend off three or four bullies your chances are not very bright. The best thing that helps you with bullies is your own friends, they will stick up for you and will teach the bullies a lesson and show them that bullying is a very serious thing and not something that is just a joke. Hai as I read your post I can visualize the thoughts going through your head. You are someone who cares about others, even people that you would not call a close friend. You are protective and a person anyone would feel proud to have in their lives. Thank you for being such a caring and humble class member. I know I feel lucky to have you in my grade. Well done you posted a truly heartfelt message, that I hope many read and take in your words. I feel sorry for all the people that got bullied. I think that people should think twice about bullying and should find something else to do. The people getting bullied should get help to try and heal the mental scars. I think that the victims should just try and make them understand how disgusting bullying is and should make them get punished. I know what it feels to be bullied because when I was in grade 2 I started getting bullied by a group of kids, about how short I am, and my other disadvantages.The main feeling I got was that if someone bullies you a lot or for about a week some people will be angry forever unless you do something for them,saying sorry dosen’t always make it up to people. The specific things that gave me the feelings where mebullied for, and how hard it was to have looking back at how long I have been a peacefull day without them bullieing me. I feel that if you bully somone you feel bad and you wiched you nevered did it and you feel glum. The main feeling im feeling is disappountment. People should know better, if things dont go your way then just live with it because they allways work out in the end. Scrunching up paper is the same as BULLING. The creases in the paper represents the scars on the person you bullied woons heal scars dont once your scared your scared for life. Sorry is just a word spoken several times over and over again unless you actually mean it. Think about what we do before bulling who ever bullies should get punished if I got stood on I would feel up set and really angry and I wouldn’t feel like I want to kill my self, thousands of people die from bulling so lets stop it all together. I never think of bullying that way before the kids that are bullied all the time must feel like nobody cares about them at all. When the teacher was doing the lesson about bullying that was the important bit of all . 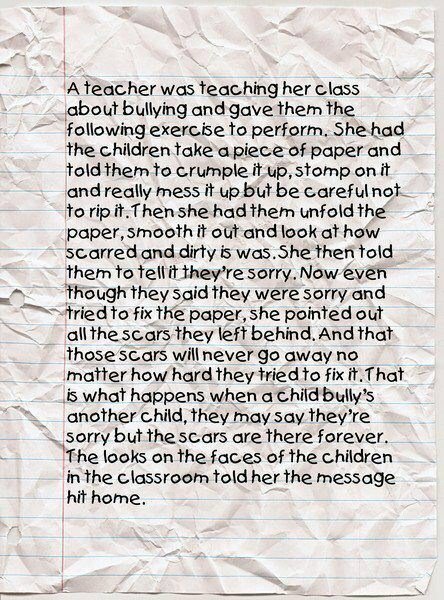 I can feel both sides of this bulling but if they did stop the bullying maybe it would be better for everyone. I feel sorrow because all of the people that have been bullied feel like nobody cares and nobody likes you. I have had that feeling before it feels terrible. The main feeling that I get is the feeling that people get when they regret doing something that they did in the past. I feel that because when I bullied someone badly I couldn’t forget it and won’t forget it. It also makes me feel regretful from when I badly hurt a student at my previous schools. The specific things that gave me this feeling is it makes me feel regretful from when I badly hurt a student at two of my previous schools, out of all the schools that I have been to. It makes me think that the message is that it is not okay to be a bully because the person that gets bullied will have alsort of memories from the bullying.